Solar Tech is a joint venture of WarmStream and Worldwide Renewable Energy Pvt. Ltd, having a two and half decades experience in sales, Installation and Services of Solar Systems. Realizing the tremendous growing need of SPV Modules at national and international levels, they ventured into a Manufacturing Unit. Solar Tech has a team of dedicated professionals and experts in the solar field. Solar Tech provides the products with cutting edge technology and of the best quality. Solar Tech manufactures/markets Solar PV Modules ranging from 3Wp to 260Wp. 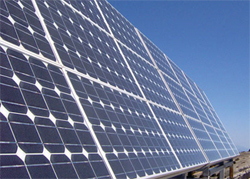 Solar Tech uses the latest Solar cell technologies for Mono/Multi crystalline modules. Solar Tech has a state of art semi-manufacturing line with installed annual capacity of 10MW.